Meet some butterflies, moths, bugs, birds, fish and turtles at the Cambridge Butterfly Conservatory. There you will find a magical tropical forest with beautiful butterflies fluttering by you, and hear/see a gushing waterfall and goldfish pond complete with a suntanning turtle. The butterflies and moths are very friendly and may even land on you. I consider this good luck if it happens. Here are some pictures of the conservatory! I believe this is a monarch butterfly. A path to walk along and explore. An owl butterfly (I think). A place to sit and watch some butterflies fluttering by. A turtle sunbathing by the pond. Have a happy healthy holiday eating! Happy pumpkin carving! 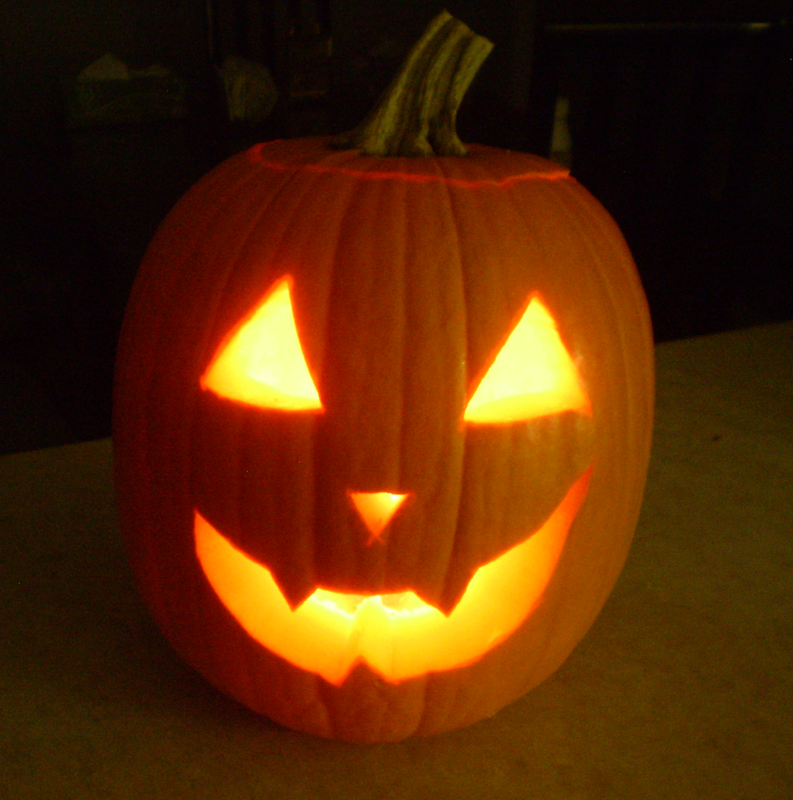 Here’s a quick pumpkin carving food thought: instead of discarding all the pumpkin insides, keep the seeds and make a tasty pumpkin seed snack. Here’s how. 1. Clean the seeds thoroughly and remove any membrane. 2. Pat the seeds dry as much as possible. 3. Place in a single layer on a lined flat baking sheet. 4. Put into a preheated 375º degree oven for 20 to 30 minutes. The length of time will depend on how well the seeds were dried. 5. When done, sprinkle a bit of sea salt over the pumpkin seeds and enjoy. Today is Valentine’s Day and over the past while, I have been researching the origins of this lovely day. Here is what I discovered. Who was Saint Valentine? There are several saints named Valentine who were honoured on February 14 and hence no one definitive saint has been given this distinction. However, a popular candidate is Valentine of Rome who was a priest. The story goes that the ruling emperor at the time outlawed all engagements and marriages in Rome. At the time, the emperor was having trouble recruiting soldiers for his military and suspected it was because the men wanted to stay at home with their lovers. Valentine married couples in secret and was punished with death (AD 269). Reference: Curious Events in History by Michael Powell, 2007. What are the origins of this day? Around the time of St. Valentine’s death (AD 269), packs of wolves were known to attack animal herds. In hopes of keeping their herds safe, shepherds dedicated an annual festival (called Lupecalia) held from February 13 to 15 to Lupercus, who is the Roman god of shepherds. As part of the festival’s rituals, young women’s names were put into a box and then drawn by the young men. These couples were paired off for the rest of the year. In AD 496, Lupecalia was renamed St. Valentine’s Day and February 14 chosen to mark the occasion. References: Curious Events in History by Michael Powell, 2007 and Wikipedia. History behind Valentine’s cards: Valentine’s greetings date back to the Middle Ages when lovers sang or recited their valentines. Written valentines began to appear around 1400 when they were often replaced with Valentine’s Day gifts. Some were made of paper while others were made with lace and ribbon. The oldest valentine known to exist dates back to this time and is currently housed at the British Museum. 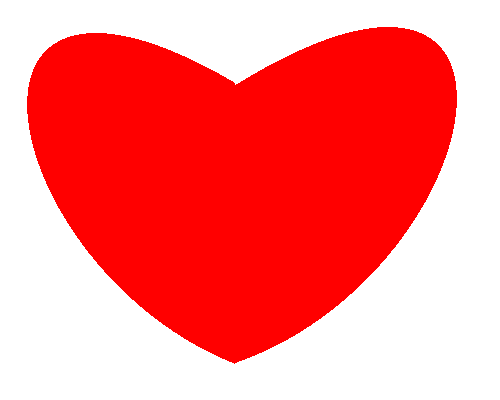 The production of valentines in factories began in the 1800s. Today, approximately one billion valentines are delivered around the world. Venus is the Roman goddess of love. Her son is Cupid. 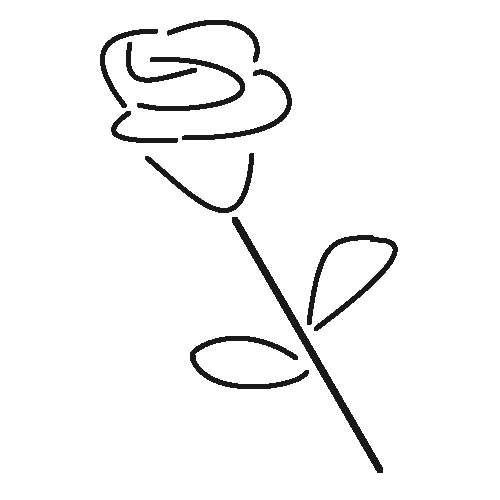 The red rose was Venus’ favourite type of flower. Giving a Valentine’s gift to a pet is not uncommon. Teachers receive the most valentines, followed by children, mothers, wives and sweethearts. Hallmark Cards produced its first valentine in 1913. Some consider Casanova the world’s greatest lover. In the past, physicians advised their patients to eat chocolate in order to soothe their grief for a lost love. Valentine’s Day is not an official holiday. Valentine’s Day Humour: A friend of mine, who knew I was researching Valentine’s Day, sent this clever joke to me. Supplies needed to make your own card. This isn’t a post related to food, cooking, eating or food places in anyway but it is about creating something beautiful from unused (and often discarded) items. The art of transforming unused or unwanted objects into something of value is known as upcycling. 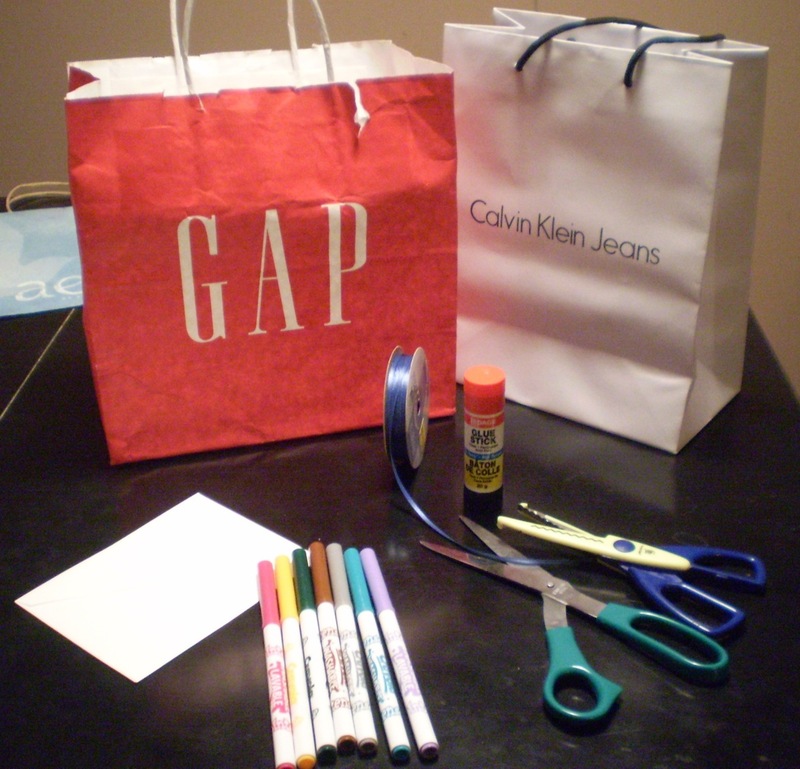 My upcycling idea is to turn shopping bags into homemade holiday cards. 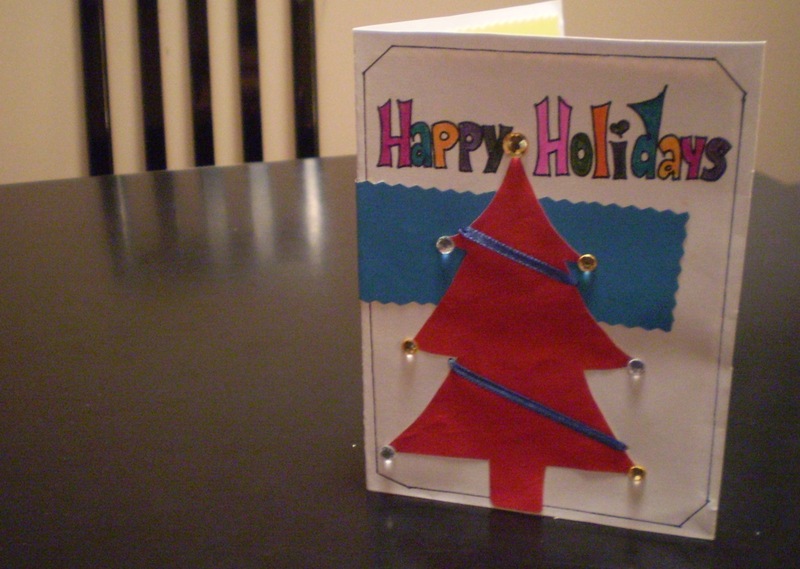 In fact, I appreciate the gesture of a handcrafted card much more than receiving a store bought card. This is also an ideal project for kids and, of course, can be done any time of the year for any event. I have turned many bags into birthday cards, Valentine’s day cards, get-well cards, anniversary cards, thank you cards, etc. (optional) Any other craft supplies you may want to use on your card such as glitter, stickers, ribbons, etc. Although there are many variations, the following are step-by-step instructions for a design of a Christmas card. 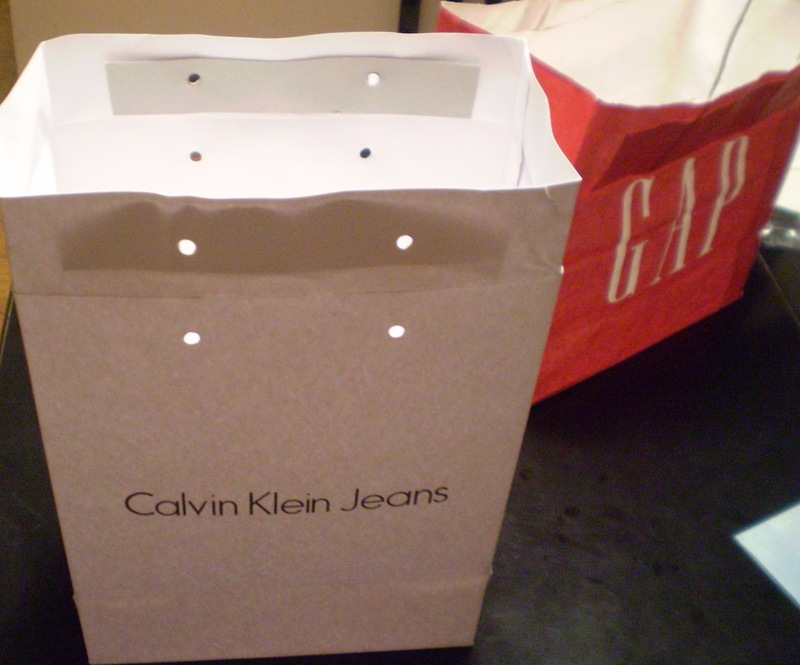 I was inspired by the red and white paper bags that I had and the upcoming Christmas holidays. 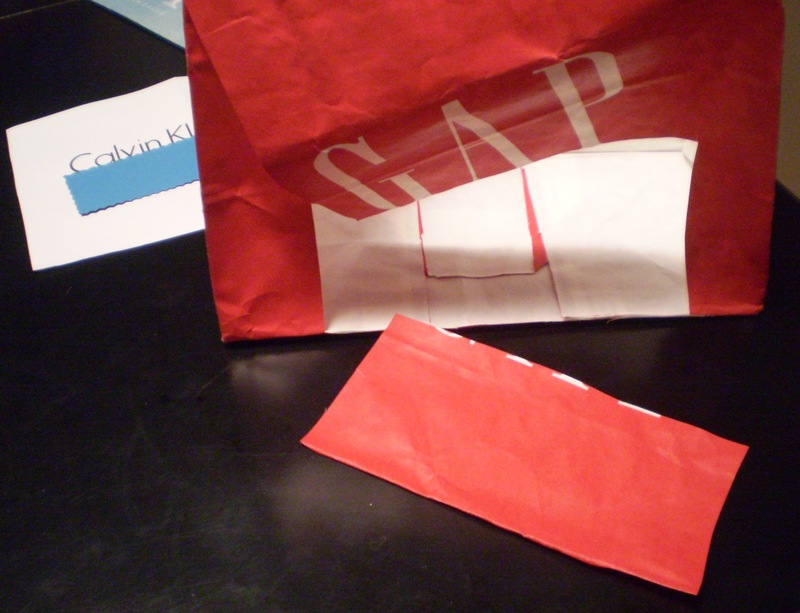 Step 1: I am using the white bag as the base of the card and the red bag to make a Christmas tree. Remove the string from the bag if necessary. Save the string for later use. 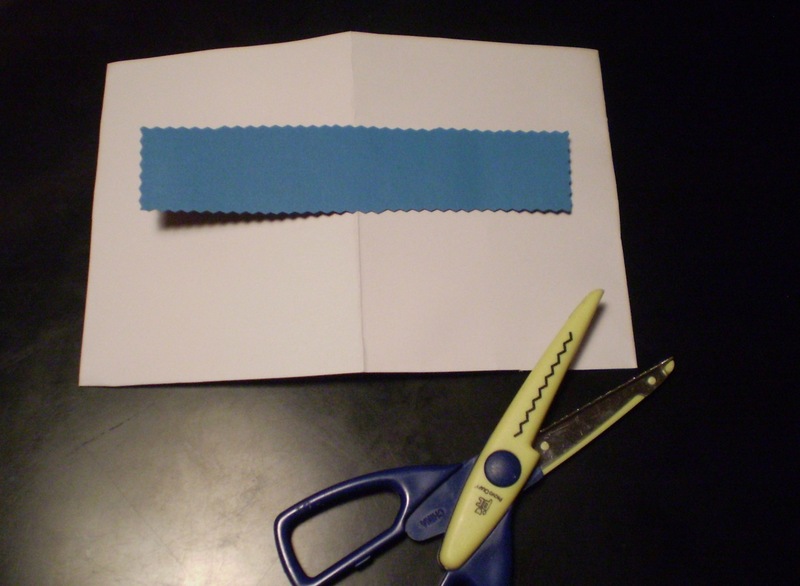 Step 2: Cut out a rectangle that is twice as long as the envelope. 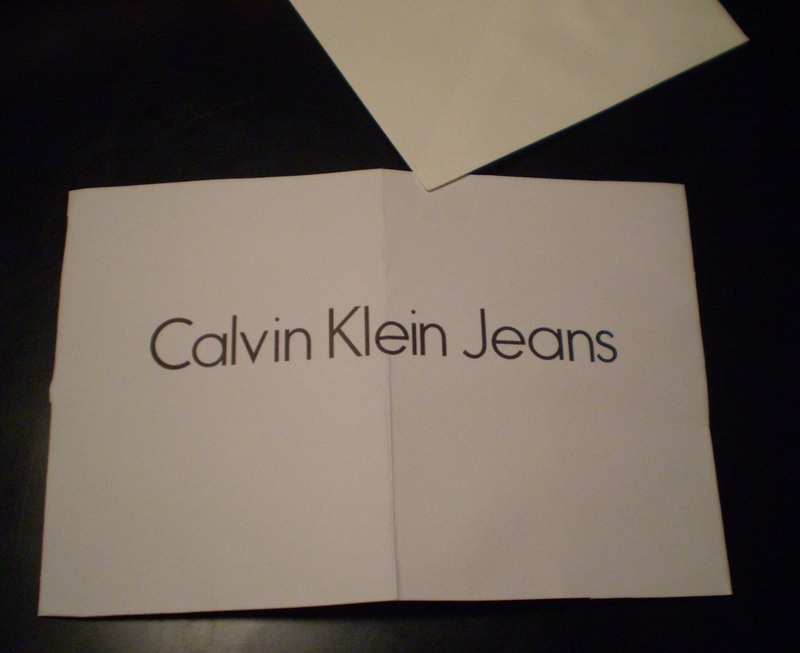 There is unwanted writing on the card but this will be fixed in Step 4. 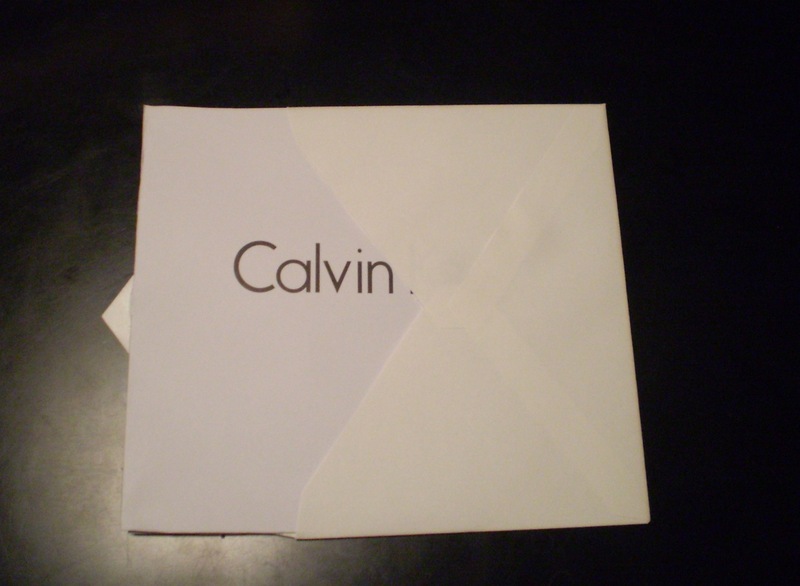 Step 3: Fold the paper in half and ensure that it fits into the envelope. If not, trim the card accordingly. Step 4: Since there is writing on the base paper of the card, cut a strip of coloured paper just big enough to cover the words. In this case, I had enough material for a cutout from a blue bag I had previously made a complete card from. I used craft scissors to create the jagged edges around the cutout. 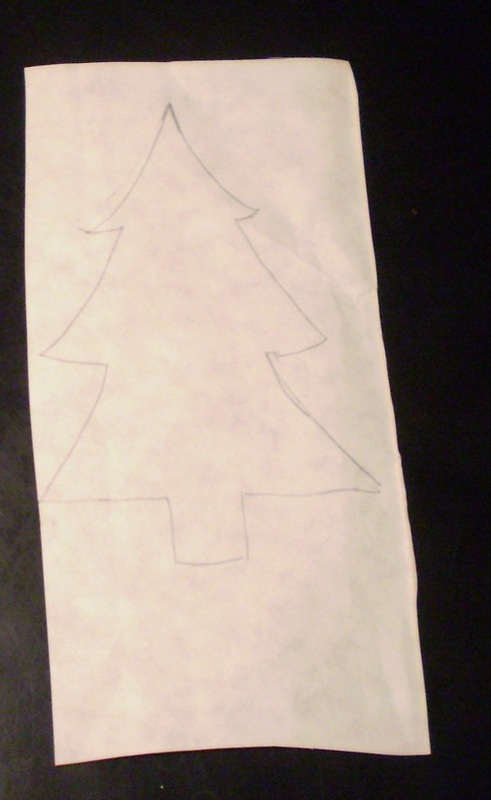 Step 5: Now cut a big enough patch from the red bag to make a tree. 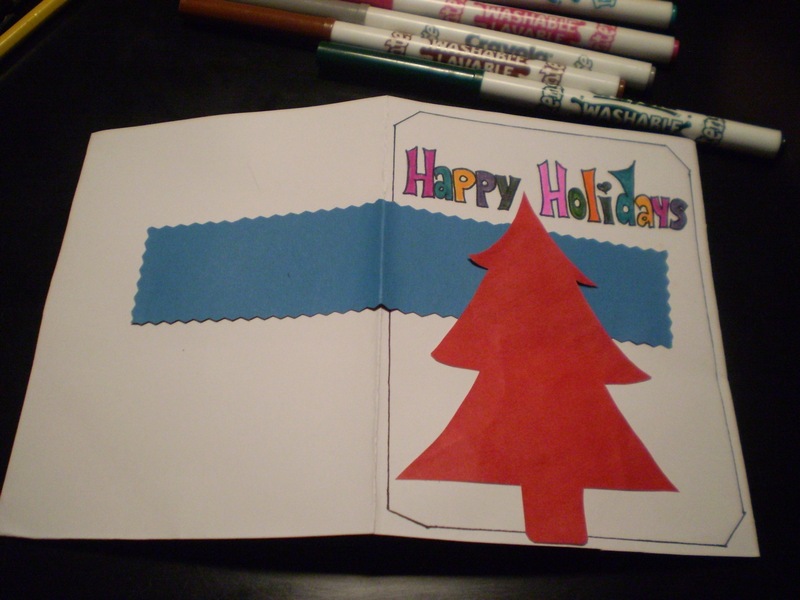 Step 6: Flip the red paper over and using a pencil, draw the shape of a Christmas tree. It doesn’t have to be perfect or even symmetric. Cut out the shape of the tree. 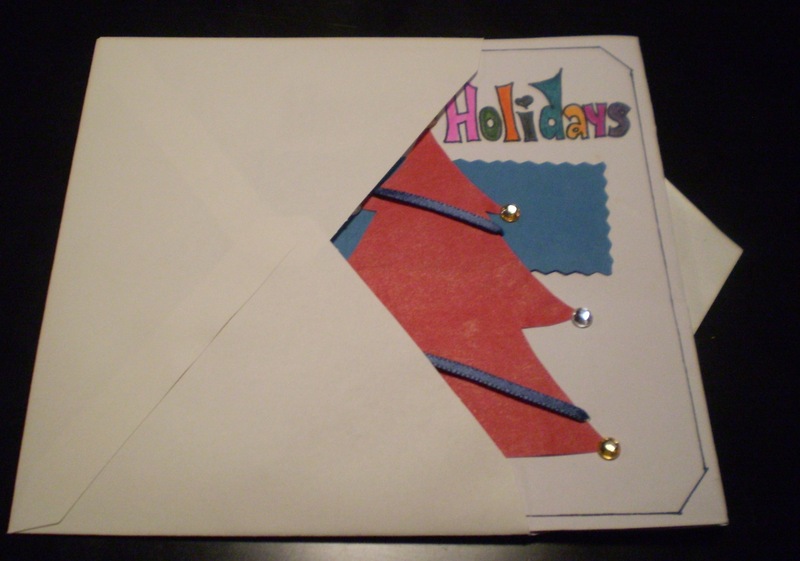 Step 7: I usually like to make a thin border on the front of the card but of course, you don’t have to. 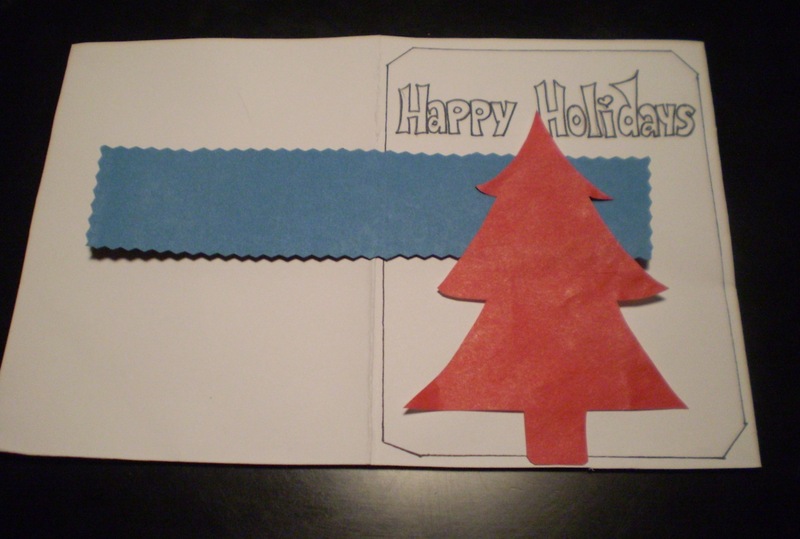 Before glueing, position the blue strip and red tree to preview how the card will appear. Leave enough room at the top to write a small greeting. 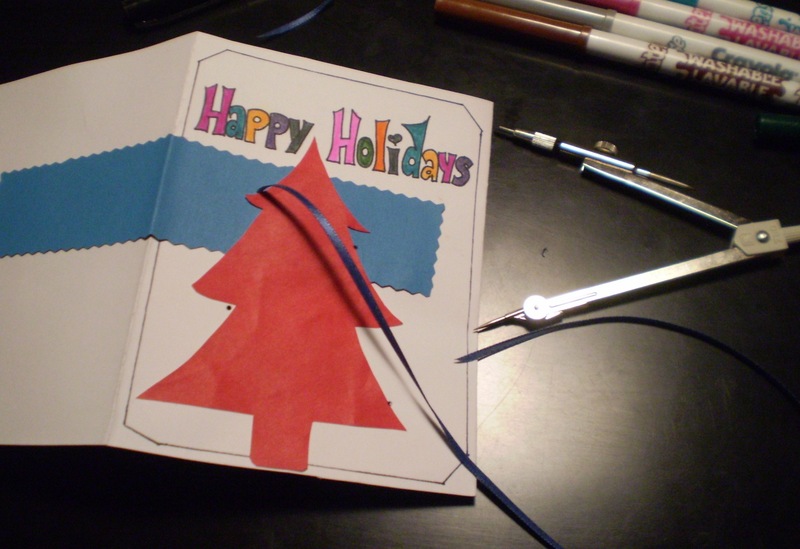 Step 8: Once you are satisfied with the layout of the card, use a pencil to write in the greeting. Trace the words with a black marker. 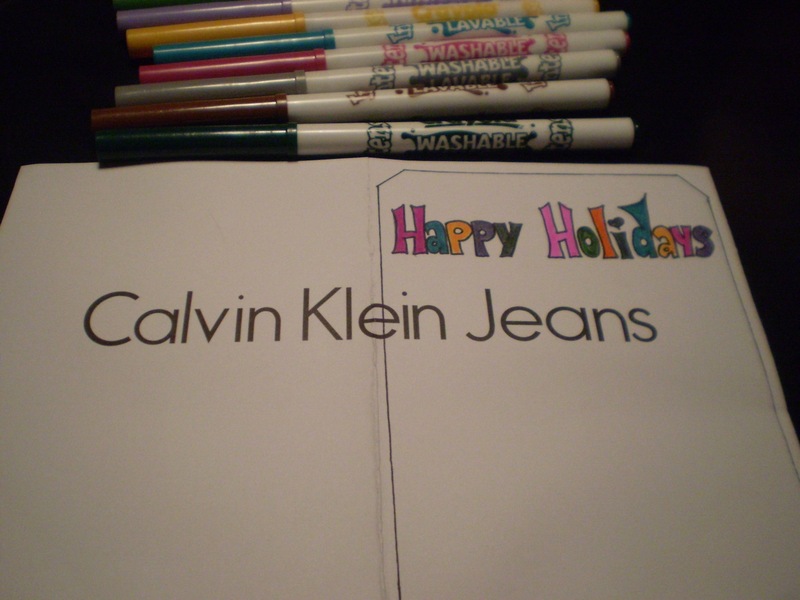 Step 9: I wanted my card to be cheerful and festive so I coloured in “Happy Holidays” in a variety of bright colours. After the ink has dried, erase any pencil marks. 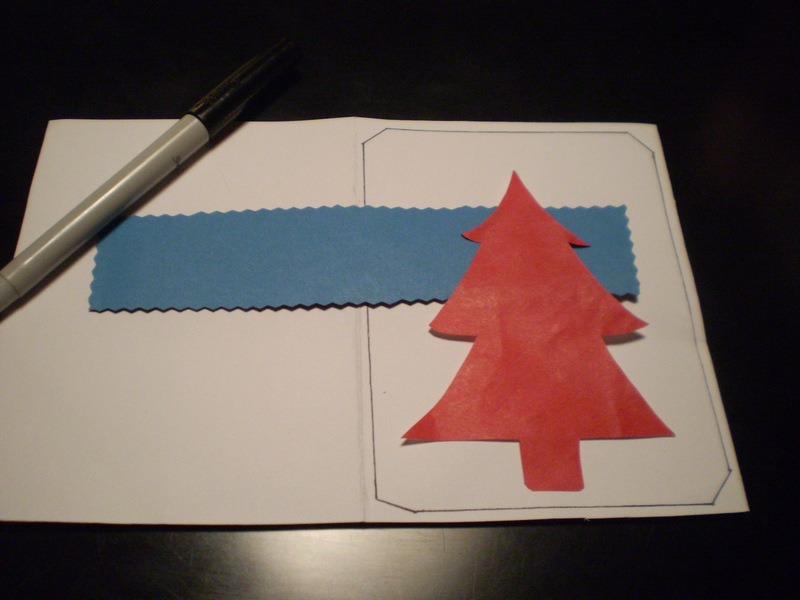 Step 10: Glue the blue strip first, then the tree. At this point, the card is done if you wish. I wanted to decorate my tree with some ribbon and sparkles. Step 11: Using a sharp point (in this case, the tip of my math compass worked nicely) poke four small holes along the tree where you think appropriate. Thread the ribbon through the first hole. Continue threading through all the holes. 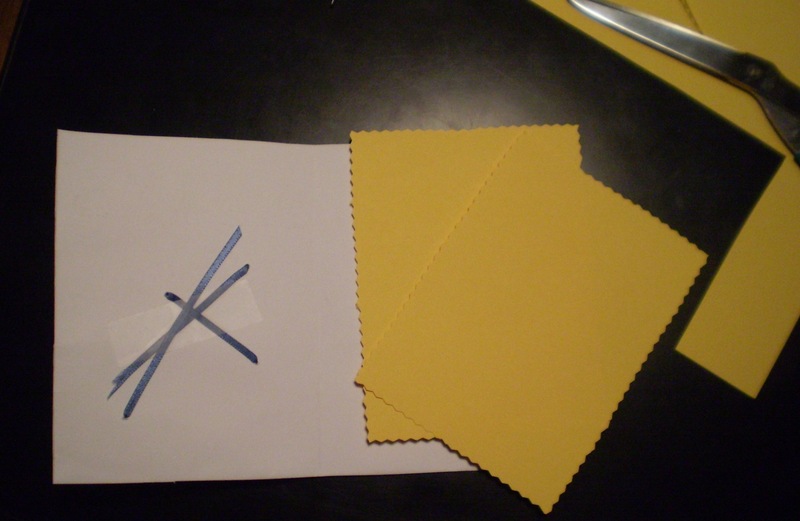 Step 12: The ribbon will now be visible on the inside of the card. Tape the two free ends of the ribbon. 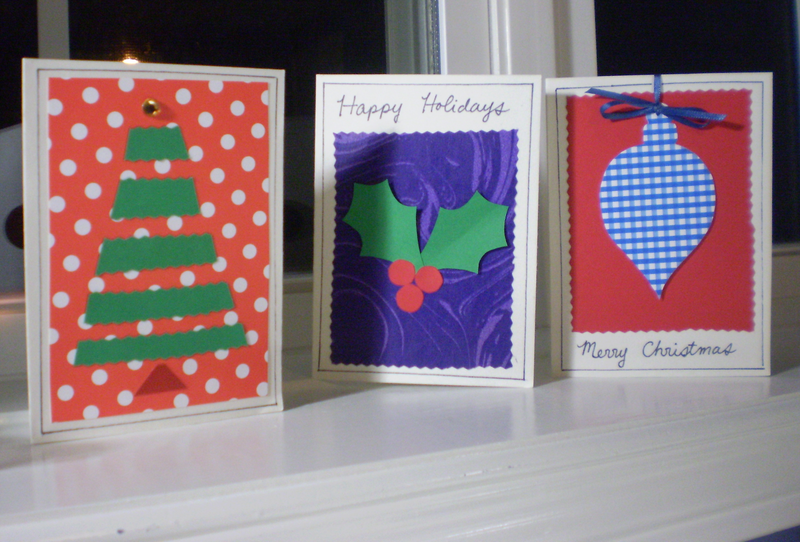 Step 13: Using some plain or coloured paper, cut two rectangles just smaller than the actual card. 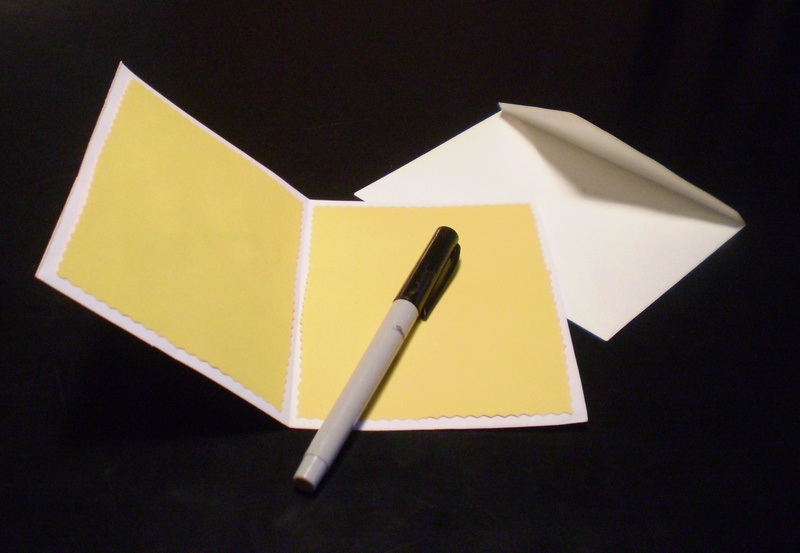 Step 14: Glue the precut yellow paper to each half of the inside of the card. 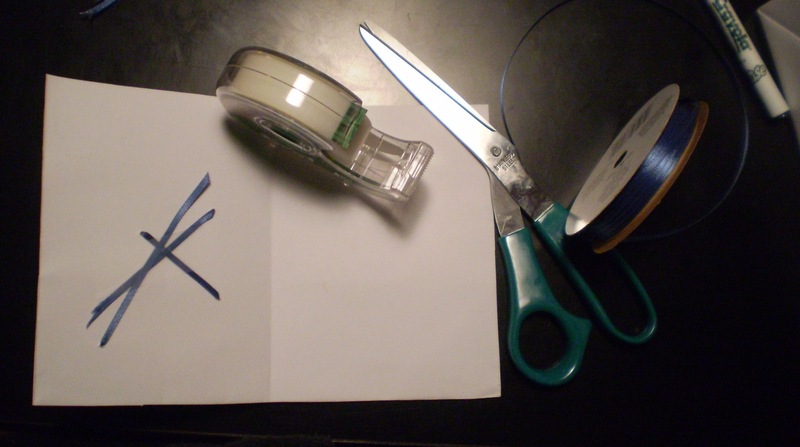 Once the glue has dried, you can write your personalized message on the inside. Step 15: Lastly, I had some rhinestone stickers which I thought would make perfect tree ornaments. Place them however you wish. Step 16: Mail your card!